Rush Island Power Station is located near the southeastern limits of Jefferson County in Festus, Missouri. The plant is operated by Ameren Missouri. It was built within a delineated FEMA floodplain, bordering the Mississippi River on its east side and situated just north of the Isle du Bois Creek. This 261-acre facility is a coal-fired power station that currently maintains a settling pond to hold fly ash byproducts. The Rush Island Power Station was built in the early 1970’s. The station has a diked ash pond, commissioned in 1976, that is a ring levee said to have been constructed of material from the surrounding floodplain. North of the dike, the ash pond is full and has excavated pits for ash disposal. Ash is disposed into the individual pits using a wetted dry ash nozzle, making it possible to minimize water and ash mix. The USEPA inspected the Rush Island Ash Pond area in 2010, following the catastrophic failure of an ash pond system at a coal-fired power plant in Kingston, Tennessee. Seepage was noted in two areas along the north side of the levee system during this inspection. No moving water had been observed, but standing water due to an elevated water table in these areas is still present. To eliminate future potential for seepage in the area, installation of a soil-bentonite cutoff wall was recommended. 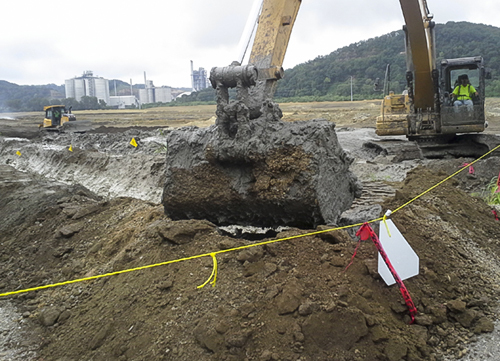 Excavation was accomplished under bentonite slurry using a Komatsu PC490 excavator and Geo-Solutions’ long-reach stick attachment. 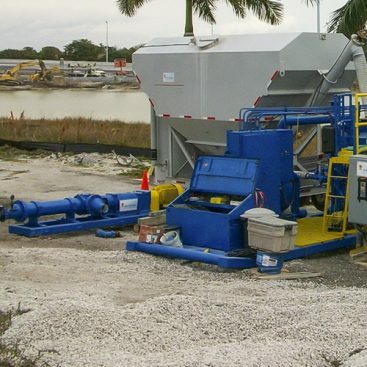 Bentonite slurry for trenching was produced on site in Geo-Solutions’ custom-made batch plant and pumped to the trench. The SB wall was 1,300 feet in length. Geo-Solutions performed a thorough mix design before beginning work. Soils from three boring were provided and Geo-Solutions created a series of candidate mixes. From these mixes Geo-Solutions selected a workable backfill mixture which met and exceeded the target permeability of 1 x 10-7. 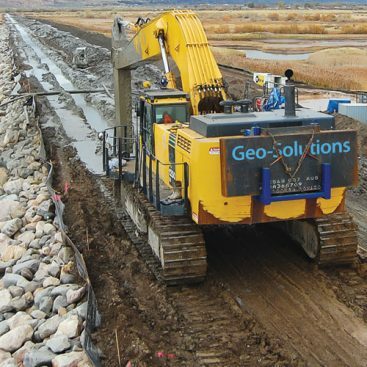 Soil conditions in the field generally replicated those in the lab, and Geo-Solutions’ fully documented Quality Control program ensured that the wall backfill obtained a comparable permeability. After installation of the slurry wall was complete, Geo-Solutions installed an engineered cap, consisting of a layer of geo-grid, compacted clayey soils, and a layer of gravel to restore the levee road to a usable condition. 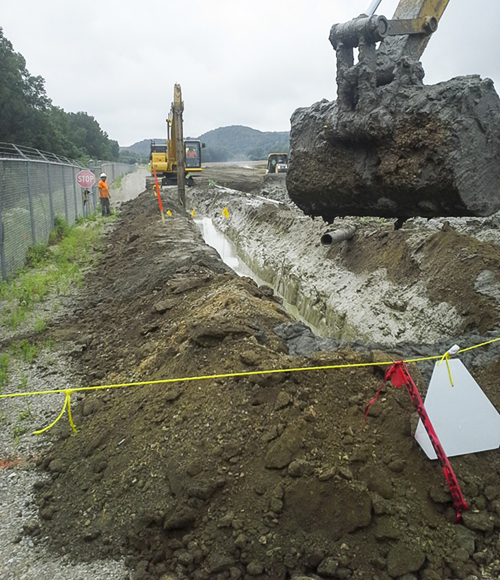 Excavation along a narrow corridor, with utility lines along one side, and a chain link fence along the other prohibited the PC490 from executing a full swing to place spoils for backfill mixing. 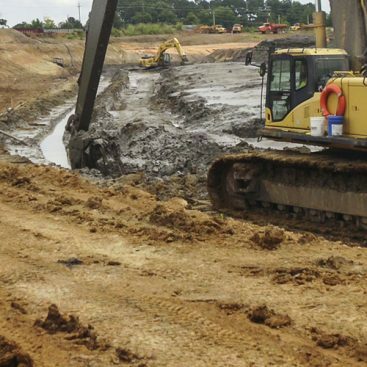 The utility location also prohibited the dozer from placing the backfill directly into the trench. Spoils were relayed by a CAT320 long reach and a John Deere 225 excavator to the spoils pit and finished backfill was placed into the trench by the same machines, reducing efficiency of wall installation. Additionally, heavy rain, totaling 10.5 inches over the course of the project, greatly impacted the trench capping operations. Despite these challenges, the project finished on-time and with zero incidents, accidents or near misses.